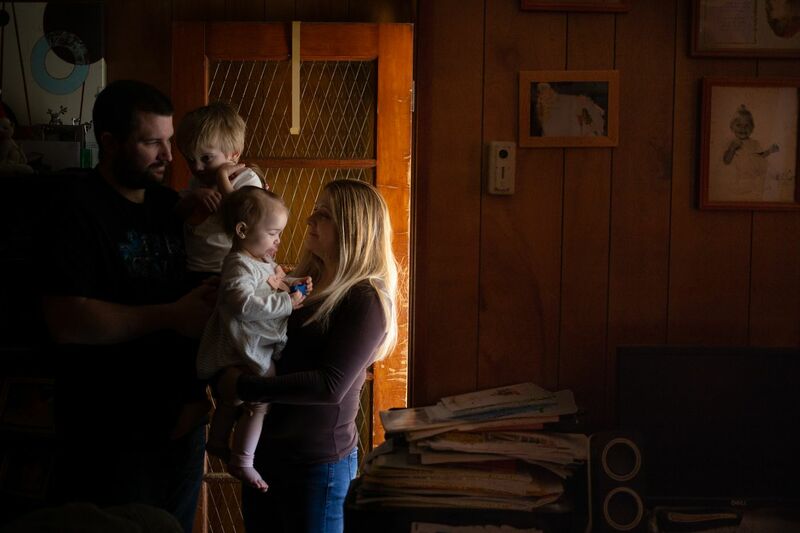 Maggie Sabatino stands in her home with her husband, John, and their children, Callen (left), 3, and Kensi, 1, in their home in the Pennsport section of South Philadelphia. Sabatino is a TSA staffer working without pay due to the national government shutdown. Maggie Sabatino is “essential personnel” with the Transportation Security Administration, which sounds like a good thing. As an “essential” lead transportation officer at Philadelphia International Airport with seven years on the job, she’s required to work during the government shutdown, but she will not be paid until after the Trump-imposed blockade is lifted. By then, she may be deep in debt because hers is, by her description, “a paycheck-to-paycheck family.” She has about $500 in the bank. Period. We sat at her kitchen table Saturday morning, a few hours before she began the 1-to-9:30 p.m. shift that she works Thursday through Monday. It was a day after she did not receive her paycheck. Working without pay is not American. The family is Maggie, 34; husband John, 34; son Callen, 3; daughter Kensi, 1; and three cats. They live in a typical three-bedroom South Philadelphia rowhouse in the Mummery heart of Pennsport. Maggie is one of the 800,000 federal workers affected by what is now the longest U.S. government shutdown. Half of those workers are deemed “essential” and therefore are required to work. In some respects, she’s better off than others. When the shutdown ends, she will get her back pay. Government contractors may not. She doesn’t have a mortgage because she got her house after her parents died. “It is the house I grew up in,” she tells me as John supervises the kids in the living room. They pay the annual $2,665 real estate tax in monthly installments to avoid a big annual bill. It is the first bill they pay, because they won’t run the risk of losing their home. Burned by credit card debt during a dark period in her 20s, Maggie doesn’t let bills build up. She has no leftover Christmas bills to pay, because she paid cash for everything. I ask how she buys things that cost more than she has in cash. “If we can’t afford it, we don’t get it,” she says. That’s not American, I joke, as Sasha, a gray and white cat, jumps into my lap. “It’s safer,” she replies with a smile. On paper, the family has a middle-class income, but that’s an illusion. Household expenses, utilities, cable, and food are high, she says. Maggie couldn’t buy her car, a 2015 Nissan Rogue, with cash. That big ticket required a loan. She also owes a crushing $76,000 to the University of Phoenix for the degree she earned in criminal justice. Maggie has some challenges that others don’t. Callen is autistic, and John works punishing 12-hour shifts with a medical records company on Tuesday and Wednesday, Maggie’s days off. That gives John more time with Callen, and allows the couple to be Callen’s caregivers and save on child-care expenses. Maggie does not know how she will pay her bills. “With the utilities, we will pay the catch-up game,” she says, and other bills will have to wait. All workers got a government form letter asking creditors to show “understanding and flexibility” toward employees, but Maggie says she’s gotten only minimal support. Her family is not in a position to help. Maggie hopes the shutdown will not last long. “People may be losing everything at this exact moment, and it’s just not fair,” she says. It’s not, and it’s not American.